We’re based out of Glasgow, Scotland but our individual members are from all over. Dundee, Orkney, Lanarkshire and Dumbartonshire. The current line-up has been together since March this year. We played our first ever gig on the 1st April 2017. We’re fairly convinced that it started off as a bit of a joke about how generic we could get the band name to be and after the chuckles wore off our silence was taken as tacit agreement. Now that I think about it; if “Power Tiger” isn’t taken you can expect an announcement on our band page in coming months. We pride ourselves on our “groove” vibes that we’ve subtly weaved into the music. That’s the party line anyway, truth is we just love to boogie and we pack as much groove into our songs as we can get away with. Truthfully, I have no idea! From the videos I’ve watched back, I have absolutely no clue why people would want to watch us! We just play the music we’ve written, act like a bunch of pillocks and enjoy ourselves. If other people enjoy it as much as we do, then that’s brilliant news. How does it feel to be back at Wildfire? Lovely! We’ve got a very strong connection to Wildfire. Our first ever show was a Wildfire showcase, our first ever festival was Wildfire and our first ever headliner was a Wildfire showcase. I’m looking forward to another weekend of live music, seeing some familiar faces and enjoying some of Kevin Murphy’s exquisite Scozzese’s pizzas. People who have been kind enough to listen to our material seem to like “Wrack N’ Ruin”. I suppose that, and “Blood Rush” are our two go-to songs. They’ll be in the set alongside as much groovy, toe tapping, head bobbing material as we can chuck at you. Our chums in Mason Hill are playing this year, we’re playing with them later this month at their headline show in King Tut’s, Glasgow so that will be fun to see them rock the place. Sauza Kings, Darkness Divine, Landslides, SKAM, Stoneface to name a few. I can’t speak for the rest of the fellas but I will honestly be catching as many of the acts as I can. What a luxury it is to be able to get into these things for free because we’re playing. I see it as a great opportunity to find myself new ear worms. This year has already been an interesting one for the band, I believe. 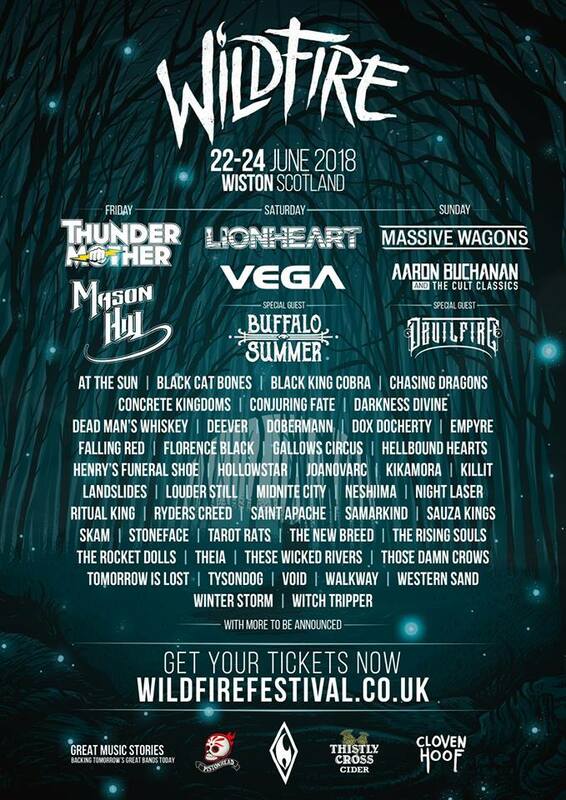 We’ve been lucky enough to play with some fantastic musicians: RavenEye, Voodoo Blood, Saints of Arcadia, SKAM, our friends in Anchor Lane and we’ve got more to check off after Wildfire I suppose. I really wish I knew, we’ve always had that “fly by the seat of our pants” attitude to planning. Gigs! Both playing and watching but our focus has been releasing new material which we’ve been prompted to do by lots of very kind, very enthusiastic and very impatient people! We’ve not rushed that though; the material was ready to record so we’ve got it tracked and new stuff will be on its way. We’ve only been at this for just over a year so we’re understanding now that its alright to stop for a spell and smell the roses so to speak. Oh! That’s a toughie, we’ve seen and played with such great talent. I’d like to play a gig with Glasgow based fellas The Sunny Devils and I’d like to have The Naked Feedback being the headliners I think. Two fantastic Glasgow based bands with some brilliant songs that I think we’d compliment fairly well and I think it would make for a sweaty night of dancing, drinking and general tomfoolery. You can catch us around tea time on Sunday if you’re interested! I tried Pistonhead last year at Wildfire but Cloven Hoof has stolen my heart. A tasty libation for all occasions.